« Junior Ranger Jr. Dirt Rocks! James Edward Mills is a freelance journalist and an independent media producer, specializing in sharing stories about outdoor recreation, environmental conservation, acts of charitable giving and practices of sustainable living. He is the author of the new book “The Adventure Gap: Changing the Face of the Outdoors” and is a co-writer/co-producer of the documentary film “An American Ascent”. In 2013, the first all-African American team of climbers, sponsored by the National Outdoor Leadership School (NOLS), challenged themselves on North America’s highest point, the dangerous and forbidding Denali, in Alaska. Mills uses Expedition Denali and its team members’ adventures as a jumping-off point to explore how minority populations view their place in wild environments and to share the stories of those who have already achieved significant accomplishments in outdoor adventures——from Mathew Henson, a Black explorer who stood with Peary at the North Pole, to Kai Lightner, a teenage sport climber currently winning national competitions. 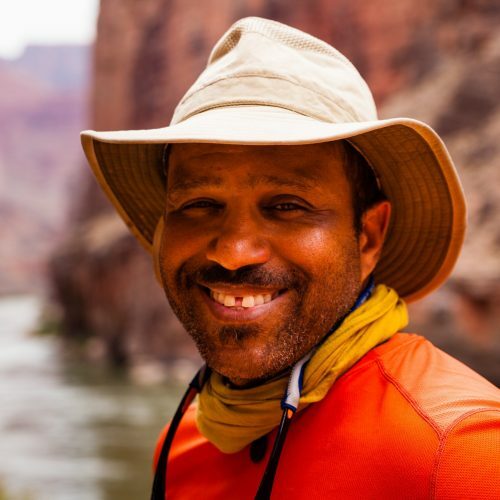 The goal of the expedition, and now the book, is to inspire minority communities to look outdoors for experiences that will enrich their lives, and to encourage them toward greater environmental stewardship. In recognition for his work in sharing the important history and legacy of the Buffalo Soldiers and their efforts at the dawn of the National Park Service, James was named a Yosemite National Park Centennial Ambassador in 2016. He was also the 2016 recipient of the Paul K. Petzoldt Award For Environmental Education. Doors open at 6:00 p.m. Lecture begins at 7:00 p.m.
Are there ID or minimum age requirements to enter the event? All ages are welcome. We do not serve alcohol at Lyceum lectures. What’s the refund policy? No refunds on ticket sales. Is my registration fee or ticket transferable? Ticket purchases are transferable. Is it ok if the name on my ticket or registration doesn’t match the person who attends? This is acceptable as long as the individual attending has a printed ticket, digital ticket, or confirmation email for proof of purchase. Happy Days Lodge is a physical/mobility accessible venue.